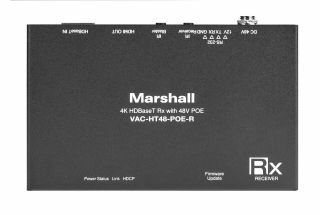 The What: Marshall Electronics has released a new HDBaseT receiver, the Marshall VAC-HT48-PoE-R. The What Else: The VAC-HT48-PoE-R receiver converts an HDBaseT signal to HDMI 1.4, supplying 48V power and allowing control via RS-485/232. Receiving uncompressed video up to 4K30 through a single CAT 6a/7 cable at 4:4:4 8-bit, 4K60 at 4:2:0 8-bit, and full HD resolutions of 1080p, 1080i, and 720p, the VAC-HT48-PoE-R can be used with HDBaseT equipment, such as cameras or monitors, to create a simple and effective way to connect with HDMI equipment over long distances. The VAC-HT48-PoE-R supports DTS-HD Master Audio and Dolby TrueHD Audio in eight channels and passes HDCP and EDID. With easy wall mounting ability, the VAC-HT48-PoE-R can be positioned and even concealed for any kind of custom installation application. The Bottom Line: For connecting pieces of equipment over long distances using HDBaseT, the VAC-HT48-PoE offers a straight-forward solution.